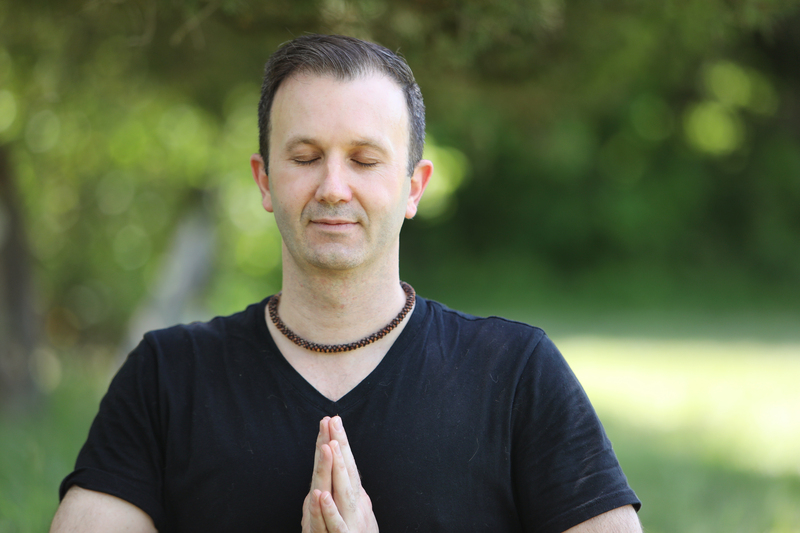 Michael Kohan, or Mukunda Chandra Das (affectionately known as Mukunda) is dedicated to helping his clients and students find balance in all aspects of their lives—emotional, spiritual, mental and physical. Mukunda is a A.A.D.P Certified Health and I.C.F Associate Certified Life Coach and a 500-hour Registered Yoga Teacher who works with others to help them restore balance in their lives by helping them to make healthier and more conscious lifestyle choices. Mukunda was born and raised in rural New Jersey, before malls and shopping centers dotted the landscape. He attended college at Penn State University and Rutgers University. In 1998, while at Rutgers, he took his first yoga class. While this formed a strong impression, his serious pursuit of the practice did not begin until a few years later. After graduating from college with a B.A. in Psychology, he moved to Manhattan, where he immediately began working in the fast-paced industry of real estate finance and marketing. In Fall 2003, after a difficult divorce and the continued strain of working long hours in a competitive environment, it was suggested that he take a yoga class as a means to reduce stress. He was immediately enchanted by the beautiful practice of asana yoga, and thrilled to find how yogic discipline and philosophy can help a person to live a more peaceful life. He quickly realized that what a person learns in in the yoga studio can and should be applied to everyday life. He began striving to embody the qualities of yoga—humility, compassion, service and non-violence. This quest continues to this day. Mukunda feels that his purpose is to serve others through his teaching, by encouraging students to become steadfast in their own practices while integrating them into their day-to-day lives. Mukunda completed his first 200 Hour Teacher Training under the guidance of Raghunath Das and Sondra Loring. Later, he completed a 500 Hour alignment-based yoga teacher training lead by Sue Elkind and Naime Jezzeny. Drawing from this training, Mukunda’s well-rounded asana classes incorporate creative Vinyasa sequencing along with meditation, clear communication, and uplifting music. Each class is infused with devotion and aligned with the spiritual teachings of the Bhagavad Gita and the Yoga Sutras of Patanjali. Although she was exposed to the practice of yoga at a young age, Sandy’s path to becoming an instructor didn’t began until early adulthood. She completed her 200-Hour Certification at the Integral Yoga Institute NYC while also pursuing a B.S. in Marine Biology. After completing both her teacher training and college degree, she started working at Ashrams for Autism, a 501(c)(3) charitable organization providing yoga in schools and facilities for the autism and special needs community. Today she serves as the Executive Director at Ashrams for Autism and spends her time both teaching for the organization and spreading it’s mission to individuals within the community. Granddaughter of a Hawaiian medicine woman from Hana Hawaii, 10th generation Hawaiian, of Samoan and Tonga decent, as well as half Maori, Naomi is a seeker of knowledge, divine moments of truth and pure love, always looking for meaning, symbols and secrets hidden from worldly eyes in the natural world. This led her to obtain her reiki training and becoming a master, starting in Japan and in Hawaii, as well as becoming a 3rd degree Martial Artist in Tae Kwon Do and Hun Gar Kung Fu. Under the encouragement and guidance of her skillful teachers and the lens of her own devoted curiosity, her practice continues to evolve. She not only is a Registered Nurse in Critical care/ Neuro, Massage Therapist focusing on sacral cranial work and myofascial release, a Certified Clinical Nutritionist, she also holds a Masters in Physical Therapy. Excited and inspired to learn more, she completed her 200-hour Vinyasa flow teacher training from Hot Yoga Revolution under the instruction of Danielle Mojo and Toni Reino. Completed Level I and Level 2 Yin Restorative Yoga certification at the Integrated Yoga Institute in NY under Corina Benner of Wake Up Yoga, but also studied under Paul Grilley, Bernie Clark and Sarah Powers.